Education tops the to-do list for development experts, and with good reason. A broad understanding that education is central to people’s welfare has led governments to devote considerable resources to increase the coverage and quality of their education systems. While these efforts are certainly welcome, and will undoubtedly increase social welfare, the tacit assumption has been that they will contribute to growth everywhere. In other words, if only the supply of human capital could be enhanced and increased, then growth would accelerate. Figure 1 depicts the financial returns from education in Mexico from 1996 to 2015. These are measured as the percentage difference in average wages of workers who completed primary education, junior high, senior high, and university education, relative to workers who did not complete primary education. 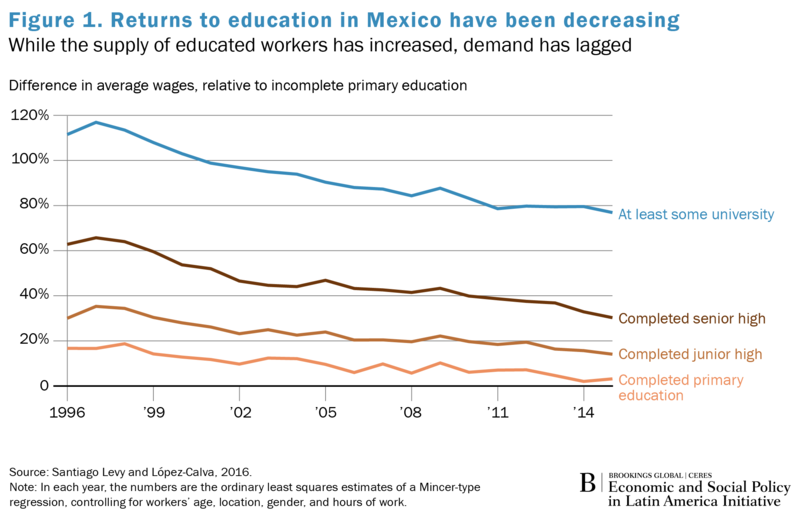 The figure illustrates a puzzling trend: If education constrained growth in Mexico over the past two decades, why did returns fall for those with more years of schooling? Would we not expect the opposite, that is, given growing shortages of skilled human capital, the market would increasingly reward those with more education? Luis Felipe López-Calva and I have explored the hypothesis that growth in Mexico has not been constrained by a shortage of human capital. The returns from education fell because while the supply of workers with more education has increased noticeably and its quality improved, demand for more educated workers lagged. In other words, the answer to the puzzle is on the demand side. But what has happened to the demand for human capital in Mexico? The key observation is that the demand by businesses (what I will refer to as firms) for workers of various schooling levels depends on the type of firms present in a given market. In Mexico tortillas are produced by large firms with sophisticated machines, and by small firms with simple technologies. The former require engineers, accountants, and managers with business degrees; the latter, only workers with basic literacy and numeracy. If there are many large firms, the demand for more educated workers is stimulated; if there are few, it is depressed. A similar situation occurs in the transportation industry: Services can be provided by hundreds of self-employed drivers each operating his own truck, or by a large firm hiring hundreds of drivers. In both cases, the number of workers and trucks is the same, but in the case of the large firm, there is also a need for an accountant to manage payroll and for a logistics engineer to coordinate dispatch. Think of apparel, food processing, or retail commerce: In these and many other cases, firms of various sizes and technological complexity produce similar goods, but with different demands of workers’ education. In all countries, firms of different productivity levels co-exist, but Mexico distinguishes itself from other countries in the extent to which this is so. As a comparison, in the United States manufacturing sector, the most productive firms are approximately four times more productive than the average firm, versus 16 times in Mexico; at the opposite end, in the United States the least productive firms are about 1/16 less productive than the average, versus 1/256 in Mexico. Comparing Mexico with other Latin American countries, the differences are less dramatic, but still quite substantial. The co-existence of heterogeneous firms in the same narrowly-defined market is one manifestation of widespread resource misallocation in Mexico. If somehow the hundreds of self-employed truck drivers could be grouped in a firm, the productivity of the transportation sector would increase and, critically, so would the demand for more educated workers. Similarly, if more tortillas could be produced in larger and more complex firms, the productivity of the tortilla sector would increase as well, and so would the demand for more educated workers. There is an important debate as to what blocks such efficiencies and perpetuates misallocation. However, as Figure 1 makes clear, lack of educated workers is certainly not the reason. Small low productivity firms producing tortillas and self-employed truck drivers are often described as being part of the informal sector, while large high productivity firms producing tortillas and transportation services constitute the formal sector. Much ink has been devoted to these terms (and, at times, much confusion generated!). Yet, labels aside, there are two critical points. First, the demand for educated labor depends on the type and size of firms present in the economy. Second, when resources are misallocated toward small informal firms, the relative demand for workers with more years of schooling will be depressed. To see how differences in the size and type of firms would affect the returns to education, López-Calva and I estimated how wages of informally employed workers would change if they worked for formal firms. The exercise measures the impact of lower misallocation on the demand for workers of various educational levels, keeping the supply of each educational group constant. 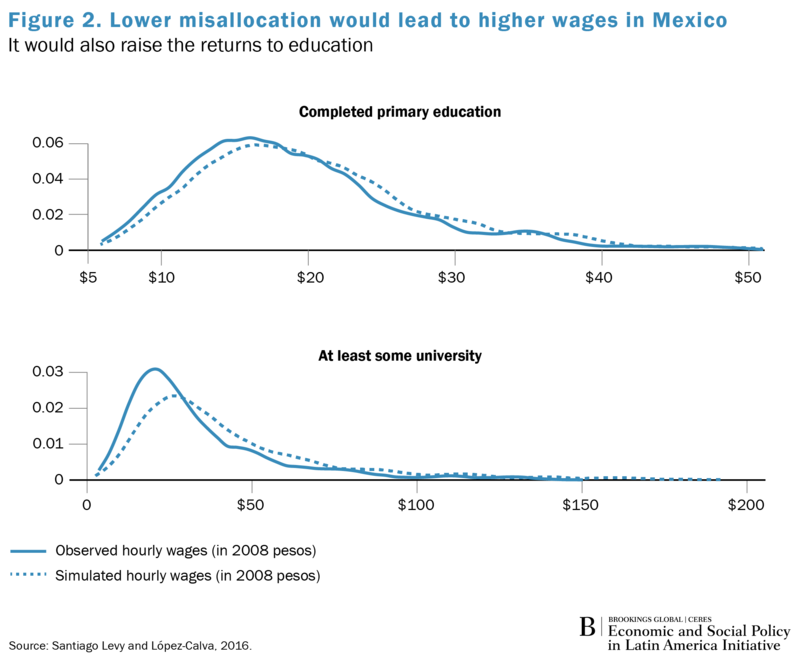 Figure 2 shows the results for workers with university and primary education (the horizontal axes measures wages per hour in pesos of 2008, but note that the scales differ). The contrast is sharp: In both cases the distribution shifts to the right toward higher wages, but while average wages of workers with primary education increase by only 3 percent, those of workers with university education do so by 29 percent. These results serve to make two points: First, misallocation is costly to workers, as the implied productivity losses lower everybody’s wages. Second, more relevant here, lowering misallocation widens the differences in average wages across educational groups, in turn raising the returns to education. Figure 2 implies that, without misallocation, the distance between the lines shown in Figure 1 would increase; but it does not necessarily imply that the slopes would change. This matters because one could argue that misallocation only causes a one-off fall in the returns to education, but should not affect the trends. To understand what is driving the trends, two phenomena need to be put together. On the supply side, over the period considered in Figure 1, the labor force grew on average at 2.3 percent a year, but its educational composition changed drastically: The supply of workers with completed primary grew only 0.8 percent, while that of workers with completed senior high and university education grew 6.1 and 4.4 percent, respectively. On the demand side, a surprising feature of Mexico is that, despite many reforms over the past two decades, misallocation increased somewhat. To give one statistic, in 1998, the difference in productivity between firms in the 25th and 75th percentiles of the productivity distribution was 23 percent; in 2013, it was 39 percent. (The same numbers for firms in the 10th and 90th percentile are 139 and 180 percent.) On the flip side, informal firms grew more than formal ones and have attracted more resources. In other words, over these two decades the imbalance grew between the supply of, and demand for, more educated workers; an imbalance directly associated with the persistence of misallocation. In its absence, the trends in demand for educated labor would have been different, and, given the behavior of supply, so would the trends in the returns to education. Misallocation is by no means unique to Mexico. Many developing countries in Latin America have numerous small low productivity firms and many self-employed workers. In other words, they have large informal sectors and misallocation is a significant issue. While the specific factors that generate misallocation probably differ between countries, in each economy the phenomenon drives two undesirable outcomes: low productivity and depressed demand for more educated workers. Many countries are investing heavily in education and pursuing reforms to improve its quality. These efforts are welcomed and must be pursued. However, in cases such as Mexico, misallocation is thwarting the returns on these efforts. The potential productivity gains from a more educated labor force can, in those circumstances, be just that, potential. It is not all about supply.